I’m fine here; my sister in-law is the one who’s being hospitalized since last Thursday. On Thursday night, we rushed to the emergency unit as she felt heart burn, chest pain and hard to breath. My brother was out of town at that time, so it’s just both of us. She’s afraid of getting heart attack. Fortunately, the EKG report showed good result. There’s nothing wrong with her heart. But since she still felt the pain, the doctor in the emergency unit suggested her to be straigthly hospitalized. It turns out that she’s affected by GERD (Gastroesophaegal reflux disease), a chronic digestive disease that occurs when stomatch acid flows back or refluxes into food pipe (esophagus). It may injure the lining of one’s esophagus and causes GERD signs and annoying symptoms such as acid reflux and heartburn (data source:mayoclinic.org). GERD isn’t a kind of disease that can be cured totally. Medications offer only short-term relief. My SIL has to change her life style especially her eating habit. She has a long list of forbidden spices, food and beverages. To avoid coming GERD, she should strict to the list. Do you have any relative or friend who also suffers GERD? We're open for advices here. I took two shots while my SIL was in the bathroom. She brought along her blue mug. 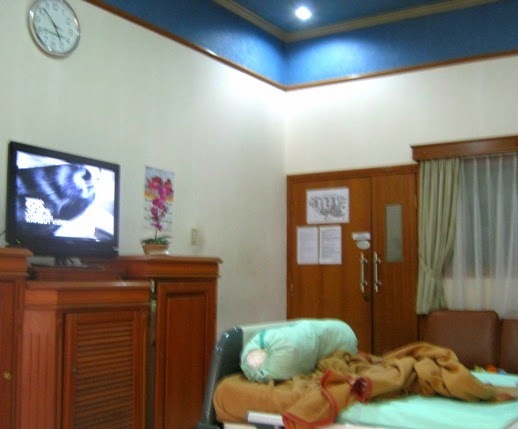 The hospital room has blue ceiling. It looks nice but nothing compares your own home bedroom. I've never seen a blue ceiling in a hospital room. What a great idea to cheer up the patient! I have heard about GERD; it's quite painful. Tell your SIS that with medicine and careful eating, she can become pain-free. After she's healed, she can slooowly reintroduce spices. Lina, sorry to hear about your sister-in-law. Hope for more favorable results. The hospital room looks cheery with some blues! Goodness, what a scare! I'm glad she's doing better. 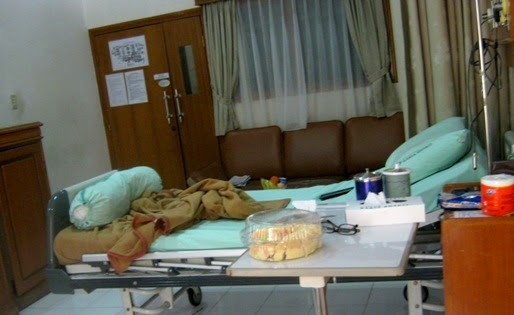 You're right, nothing compares to your own bedroom, but that hospital room looks pretty comfortable! My husband has had GERD. He no longer eats or drinks the following: Black coffee, peppermint, hot peppers or spices of any kind, cooked tomato sauce, chocolate. He also eats smaller portions andeats at least three hours before lying down. Some doctors say to raise the top of the bed so the person does not lay flat. Medicine helped him a lot. I hope your sister-in-law will feel better soon! I hope your SIL is feeling better and gets to go home soon. Love that blue ceiling. I'm glad it wasn't heart related. What a shame. I do hope the diet changes help.